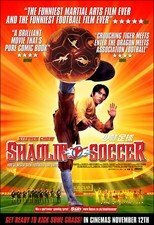 Twenty years after causing his team to lose a championship game, former Chinese soccer great Fung meets "steel-legged" Shaolin student and would-be kung fu teacher Sing. Convinced that Sing's martial arts moves can translate to the ballfield, Fung gets him to reunite his out-of-practice Shaolin "brothers" and form a team. But even with their skills, can the ragtag crew defeat the unstoppable Team Evil, owned by Fung's nasty rival? Director/star Stephen Chow's sight gag-filled rouser also stars Vicki Zhao, Man Tat Ng. 112 min. Widescreen (Enhanced); Soundtracks: Cantonese Dolby Digital 5.1, English Dolby Digital 5.1, French Dolby Digital 5.1; Subtitles: English, Spanish. In Cantonese with English subtitles/Dubbed in English.